If you were to read the staff list at St Paul’s Cathedral, where Maurice Sills was described simply as ‘Cathedral Treasure’, you might assume that a final ‘r’ had been missed from the second word. But you would be wrong, because Maurice Sills was in the world longer than you or I have been in the world – longer, I venture, than anyone reading this article. The truth is that Maurice Sills lived to be nearly one hundred and two years old, and he genuinely was a ‘Cathedral Treasure’ at St Paul’s. Travelling to work by rail and tube from his home in North London three times a week, Maurice regularly gave up his seat to what he termed ‘old ladies,’ by which he meant women of a generation later. There was an infectious enthusiastic energy about Maurice which he kept alive through a long term involvement with sport and his delight in the presence of young people. We met in the Chapter House at St Paul’s but Maurice was keen to take me up to the magnificent library, embellished with luxuriant carving by Grinling Gibbons, high in the roof of the old cathedral. When completed, the shelves were empty since all the books had been destroyed in the fire, but now the library is crowded with ancient tomes and Maurice had catalogued every one. 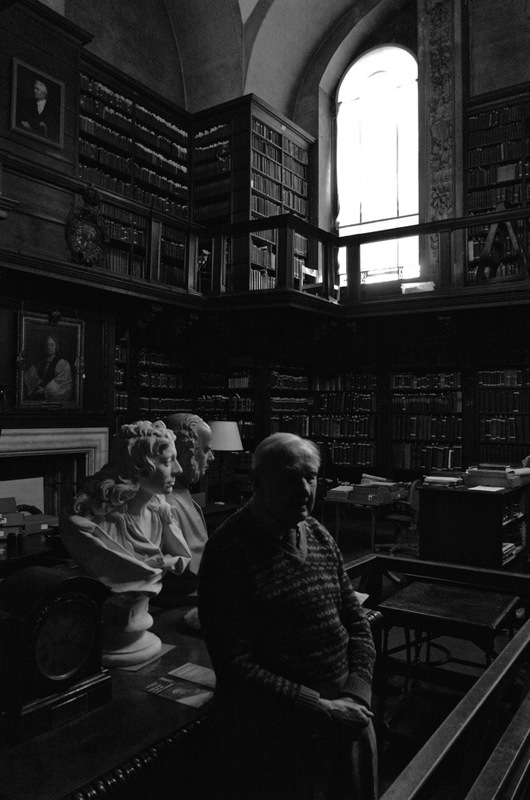 In this charismatic shadowy place, Maurice was completely at home – as if the weight of all his years fell away, rendered insequential by comparison with the treasures of far greater age that surrounded us, sequestered in an ancient library where time stood still. Maurice – My earliest memory of anything – it must’ve been 1918 – was when I was staying with a relation who was manager of a grocer’s shop called Palmer’s in Mare St, Hackney, while my mother was having another child. They sold provisions – on one side you had bacon, butter and so forth and the other side fruit and vegetables. I can still picture us going down the wooden stairs of the shop into the cellar and, in the cellar, there was an oil stove, one of these with little holes in the top that cast lights onto the ceiling – I can still see those lights there. I worked out from my relations who I stayed with that it was a Zeppelin raid! So that was my first memory of life – those little marks on the ceiling while I was down in the cellar. The Gentle Author – Maurice, are you a Londoner? Maurice – Certainly I’m a Londoner, if West Norwood is London, yes. I was born there in 1915 and my baby brother still lives in the same house where he and I and five brothers were born, six of us all together. The Gentle Author – What were your parents? Maurice – My father worked in the Co-operative Bank. My mother was purely a mother, with six boys she had no choice but to be a mother! Norwood, in those days, was almost a village. My mother’s family were the local undertakers and everybody knew them. When somebody else opened up another undertakers that caused trouble. My parents got married a few months after my mother’s father died. My mother had to look after him when he was a widower, so she couldn’t get married. That’s how families were in those days, but when her father died that was freedom, so she had a quiet wedding and we were brought up in the house. The Gentle Author – And what kind of childhood did you have? Maurice – Being the eldest of six I had a lot of freedom because my mother had enough to do looking after the others – the three youngest boys were triplets. So I learnt to enjoy life. I was encouraged to enjoy sport by my father who played cricket and I became scorer for his team when I was eight. Cousins made sure I knew what soccer was like, so I enjoyed soccer for the whole of my days until lately. I played for my old school boys until I was forty-nine when I then got hurt badly and had to give up. My mother said, ‘Serve you right, you should’ve given up before,’ but I still played cricket until I was demoted to be the umpire because they wanted younger people, they said. The Gentle Author – How old were you then? Maurice – About eighty. They often asked me, as an umpire, where my dog was? Well, a blind man has a dog! The Gentle Author – Did your parents bring you up to London to the West End? Maurice – No, because we didn’t go far. We had a fortnight’s holiday every year in Bognor, Eastbourne or Clacton – a long way then. Other than that, the only outings I took on my own would be on bank holidays when I went to Crystal Palace where there was always a lot to see, whether it was motorcycle racing, speedway racing, or concerts. When I was eleven, I obtained a free place at St Clement Dane’s school close to Bush House in the Aldwych, so I used to travel from South London on a tram every day to the Embankment and walk up the road to school. The Gentle Author – What were your impressions of the city then? Maurice – One was of The Lord Mayor’s show, which was not always on a Saturday as it is today. We were allowed to go into the churchyard at St Clement Danes and see the procession go by. The other thing which stuck in my mind was that every Christmas, Gamages in Holborn used to have a cricket week where well-known cricketers came, so I would go to obtain their autographs. But other than that, in a quiet way, I suppose I got to know London very well. I had a season ticket to town so, after two or three years, I would go to museums on my own. I was allowed complete freedom. The Gentle Author – How wonderful for you to explore London. Maurice – It meant I learnt a lot about it. I went to evening classes at Bolt Court just off Fleet Street. There were lectures on the City of London and summer evenings would be spent walking round to see things we had heard about. The Gentle Author – Were you a good student? Maurice – I did all the essays I was asked to do. I kept them til a few months ago when I was moving into an old people’s home and I decided I’d just got to say goodbye to them. I’ve no regrets. It was all wastepaper, it had been in a drawer for twenty years. The Gentle Author – What age did you leave school? Maurice – Seventeen. At that time it was very difficult to get a job. The Gentle Author – This is the Depression? Maurice – 1932. Like in the world today, it’s not who you are but who you know, and my father knew somebody so I started working. I went for interviews in banks, but I couldn’t pass the medical test. They weren’t very sure about my heart so they wouldn’t take me on. My father knew somebody at Croydon, not too far from where we lived, at the Co-operative there, so I worked at the office from 1932 to 1940, doing clerical work, and playing football and cricket, until the war came and I then went into the Navy for five years. The Gentle Author – How did your involvement with St Paul’s Cathedral come about? Maurice – In 1978, when I was at evening class at Bolt Court, a lady said to me at the tea break,‘You’ve just retired, you could come and help at St Paul’s.’ I came for a few months every Thursday and one day I took a school party round. Evidently, they wrote and said they had an interesting time, because the Dean asked me the next day if I could come more often. The Gentle Author – Did you know the history already? Maurice – I’d already got the background you see. I went home and said to my wife, ‘They want me to come more often, and she said, ‘Well, why can’t you?’ She was younger than me and was keeping me in the state of life that I wanted. She was kind. She only made one mistake in her life but there we are. She put up with it and suffered me for forty years! The Gentle Author – Were you the mistake? The Gentle Author – Why have you stuck with St Paul’s? Maurice – After the Dean asked me and my wife said, ‘Of course you can,’ I took it on and for twenty-odd years I did all the school visits to the cathedral. But eventually they decided that the modern idea was to have an education department which meant they wanted a full-time paid person. I had been working twenty years for nothing and, because I worked for nothing, I enjoyed it – I didn’t have to worry what the other people thought. So I wouldn’t have put in for the new job and, fortunately, the headmaster at the Cathedral School said, ‘If they don’t want you, you can come here every day.’ So then I moved to working in the school. The Gentle Author – Were you teaching? Maurice – Helping out in various ways, especially hearing children read and going with the boys to watch them play football and cricket. For the last fifteen years I went every day, until eighteen months ago when I decided to cut it down and now I only go on Monday, Wednesday and Friday. But the little children make a fuss of me. The Gentle Author – How are you involved with the cathedral? Maurice – In the morning I’m in the Cathedral School but then, after school lunch, I help in the library. One of my jobs is to ensure that we have two copies of every service, I put them all in order and file them away. I look up letter queries for the librarian. When people write to say, ‘I believe my great grandfather was in the choir at St Paul’s,’ I go through the records. Usually they hadn’t, they had sung here but with a visiting choir probably. The Gentle Author – Do you know the collection well? Maurice – Oh yes, many years ago the librarian decided we ought to have a list of all the books. And so, in my spare time, for about five years I wrote down on sheets of paper all the books. The ones in Greek were difficult, I just had to copy the alphabet. Those records are kept and the librarian still consults them today. The Gentle Author – That’s a big achievement. The Gentle Author – Do you like the cathedral? Maurice – It’s given me a great deal. I’ve walked with school parties up to the top of the dome at least two thousand times, but I can’t do it any longer. The Gentle Author – When was the last time you went up on top? Maurice – Oh, probably five years ago. I’ve only become an invalid in the last two to three years really. The Gentle Author – You don’t seem like an invalid. The Gentle Author – Do you have any opinions about Wren’s architecture? Maurice – Only insofar as I’ve read so much about it that I realise, in my lack of knowledge, what a wonderful person Wren was to do what he did, despite all the handicaps that he was up against. The Gentle Author – What kind of man do you think Christopher Wren was? Maurice – Well, he was so gifted at so much, you see, he was brilliant not just in one subject but in many things. And he persisted in what he wanted, even though it wasn’t always easy for him financially. He was a marvellous person to have done it and I realise it was 300 years ago, you know. The Gentle Author – Three times your lifetime. The Gentle Author – What do you think are the big changes in your lifetime? Maurice – One of the biggest is computers, and now I realise my day is up. If I sit on the tube in the morning, if there are a dozen people – six here, six there – nine of them are playing with these tablets and phones. I’m not talking to anybody you see! The Gentle Author – It’s rare to meet someone so senior, so I want to ask what have you learned in your life? Maurice – I’ve learnt from experience how wonderful it can be to have sensible friends and a sensible upbringing and a perfect wife. My parents were strict insofar as we were told what was right and what was wrong. ‘I’d rather your hand was cut off than you stole something,’ my mother would say. I learnt to live – I think – a full life. I’ve enjoyed my sport. How fortunate I have been in life that I have been pushed to do things rather than had ambition. I have no ambition. When I was ending my time in the Royal Navy a colleague who was a schoolteacher said, ‘When the war is over you would make a good schoolteacher,’ and I said, ‘Of course I wouldn’t – my schoolteachers would laugh if you said that.’ But when the war was over, they were so short of male teachers, they were willing to take almost anybody. The result was my mate made me fill out a form – he pushed me and I became a teacher. A lovely man, and an enviable life. Goodbye, Mr Chips! They don’t make them like that any more. A true gentleman, in the truest sense of the word. RIP Maurice, you will be missed. I will celebrate the life of Quiet Man my way today. Maurice in his holy place made his presence felt in a gentle way for a long time !no fuss. On a bench seat in Kew Gardens a plaque reads ‘Julia has left us now she is singing her favourite songs with angels’. Maurice is now there singing his favourite hymns I hope with gusto. Poet John. PS -*Cathedral Dean/Bell ringers he deserves a peel of bells ok. Preferably Whitechapel ones if possible no muffling loud & clear for him please. A beautiful story and one to which I felt I had to respond. What a beautiful soul Maurice was and now he is safe with Jesus. My mum passed away at 102 and they dont make them any more like that generation. RIP Maurice. I wish I had been able to meet you and have a chat. Fond farewell to a wonderful, humble man. Once again The Gentle Author talks to someone in a way that makes you feel you knew him. through. Thank you for the introduction to Maurice, with the accompanying photos. mosaic. A tip of the hat to all of you, from the Hudson River Valley in New York. Sounds like a lovely man, and what a great innings. I’d be interested to hear where he did his teacher training, if anyone knows, as I manage the archives of several former teacher-training colleges. It would be lovely if he were “one of ours”. 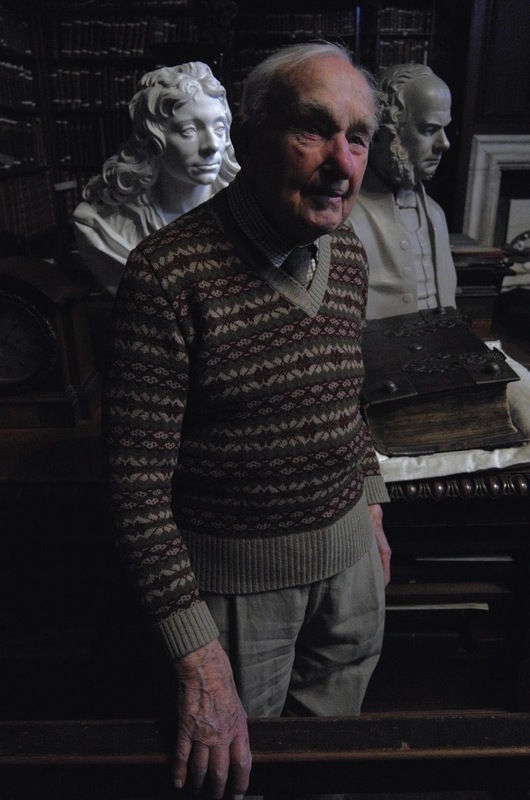 Poor old Maurice – what a great man, a lovely man, a true gentle man. I had not seen him for years & years. I remember his wife, Ellen, as well – they married in 1954. Lovely man, lovely face. I enjoyed reading about him all over again. His modesty and shrewdness are very refreshing. Such wisdom. I hope that Maurice has flights of angels to sing him to his rest. Thank you for sharing this again and letting your readers know this lovely gentleman has gone to meet his maker. Thanks for sharing a lovely article. I knew Maurice as he was a member of the Norwich City Supporters Club, the Capital Canaries. 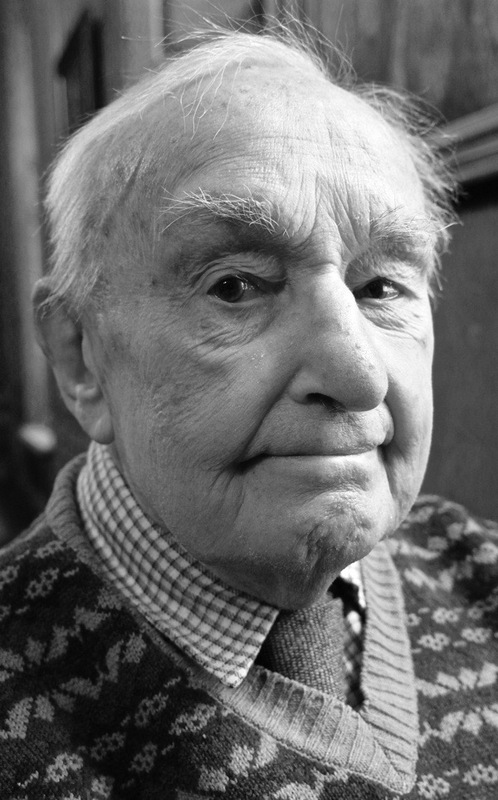 Maurice was a regular on the London/Norwich train with us all for many years before deciding that the journey was too much at the young age of 98 or so. He was an amazing man, had time, kind word and a story for everyone. It seems appropriate to share a fondly-held memory of my Uncle from childhood. During the 1950′s, Maurice and Ellen lived quite close to us on the borders of Palmers Green. I well remember being invited round one Saturday morning when I was about 7 or 8 because the BBC Home Service was conducting an experiment in something called ‘stereophonic sound’. We duly followed the instructions to ‘place the radio receiver in one corner of the room, opposite the television’ and were eventually treated to the sound of an underground train appearing to move, as if by magic, across the room, from left to right. I remember we were both amazed, but not sure if the development would have any practical purpose….right up to his passing, Maurice was always an engaging educator and I know many, including myself, will have had cause to thank him for that. All down – throughout – the turning of the pasting years – throughout you gave us laughs and smiles! So teaching youth – each year, upon by year – and us, to all, to each, your love of Christ you held adored! You held the lantern! – So adorned aloft! That carried afar… HIS light, the glow to lighten future paths for miles…! The Light of the World…! You truly saw! And you, humbly in your life’s dedication – you moved us towards our Lord! Good Bye! – Mr. Chips – Farewell! May the light of light, perpetual shine upon you, and safeguard you in eternal peace! Dear Maurice, I miss you and our chats in the Chapter House. It was an honour to have known you and I am proud of the way the cathedral’s community has marked your passing with pomp and also such genuine expressions of admiration and love.